WE’ve SPOTTED THEM at Dcon! Back in Febuary, the makers of those gangster pups “K-OS Team” The guys at PYT Room came out with Pakka The Alpaca! Born to rock n roll, PYT Room released Pakka The Alpaca resin version into the wild the crowds went nuts for him. 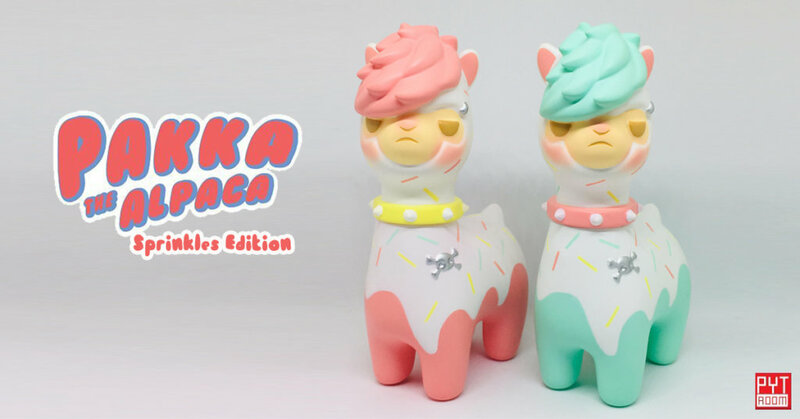 Fast forward to May and Thailand Toy Expo debuted Pakka The Alpaca soft vinyl versions which are powered by ToyZero Plus and Hell Toy as a part of the Kidult toy collective . Various editions sold out instantly at TTE, no surprises there. Don’t cry just yet! We saw some at DesignerCon at Ko-Re Ko-Re booth (check out our live steam below) and to our surprise, they have been made available online! The figure stands approximately 4 inches tall, comes bagged and header-ed with bonus sticker included.